1.Integrated design by optimization, two-spindle simultaneous drilling, can achieve high efficiency big lots processing automatically. 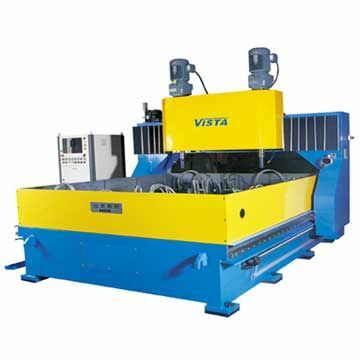 2.Plate style machine with reinforced gantry and X axis twin-screw synchronous drive ensure processing high stability and precision. 3.Galvanized pipe and ferrule connectors ensure no leakage of hydraulic. Flip-style shield ensures coolant cyclic utilization. 4.Programming software can do CAD/CAM exchange automatically, easy to operate. 5.Function with remote monitoring and diagnostics, and quick response for customer services.